An author whose literary creations have dazzled readers for five decades now. An accomplished mystery and science fiction writer, Arthur Porges (1915 - ) has specialized in the short-short story form throughout his varied career. A regular contributor to the science fiction magazines of the fifties & sixties, his best known story is probably The Ruum, a much reprinted tale with a style that typifies the majority of his unusual work. And what stories! Dusty Answer, Dr. Blackadder's Clients, A Specimen for the Queen, Priceless Possession, Aunt Rutabaga, Movie Show, A Touch of Sun, A Puzzle in Sand, The Dragons of Tesla, By A Fluke,......and many, many more. der Kaiserin Königin Maria Theresia. 4 rue Choron, Paris 9ème N.Y.P.L.
" Du même auteur, en préparation : Tom Paine, Frédéric List "
"A M. Carl-J. Burckhardt, en souvenir des Jeudis de la "Villa Barton", E.P. " Signed : "à Genève, Décembre 1945"
Basel : Verlag für Wissenschaft,Technik und Industrie, c. 1946, 247 p., illust. N.Y.P.L. in eleven scenes. in German. ... Menach in fesseln; ein Drama um Heinrich Heine. Ein Spiel in 3 Aufzügen. Musik von Karl Senn. Als Bühnenmanuskript gedr. . The mineral waters of Carlsbad, considered from a homoeopathic point of view for physicians and patients. Prague : P. Haase Sons (? ), 1862, 162 p.
Das Bühnenfestspiel in Bayreuth. Eine Studie über Richard Wagner's "Ringdes Nibelungen"
Published by Chilton Company , Philadelphia & New York, 1962 N.Y.P.L.
" To Cele Porges, a remarkably patient wife and thorough, persistent researcher "
Irwin Porges was born in Maywood, Illinois. He studied piano and music arranging at a music conservatory and became a professional pianist with dance orchestras. He was taught music and has been a popular song composer. After World War II, he moved to Los Angeles and by 1953 had received his B.S. and M.S. degrees from the University of Southern California. He began his writing career in 1955 and has sold countless stories and articles to such Magazines as Coronet, True, Science Digest and American Mercury. He also wrote a TV script for " 77 Sunset Strip " in 1960. "Many Brave Hearts" is his first book. He is presently teaching English and courses in writing at Los Angeles Valley College, Van Nuys, California. Chilton books, Philadelphia, 1963, 191 p. N.Y.P.L. A dramatic, historical study of the rising ride fo lawlessness in our country. Monarch Books, Inc. Derby, Connecticut, Novembre 1963, 143 p.
Handbook of heating, ventilating, and air conditioning; useful tables and data arranged in a manner convenient for ready reference. Zürich Univ., Phil. II Diss. Leipzig : C. E. Poeschel , 1911 , 123 p. N.Y.P.L. German translation by Porges' niece Gabriele Jordan, née Porges. Eleanor E. Buckley and Nandor Porges, Washington, 1956, 467 p.
at the annual meeting of the American Association for the Advancement of Science, Berkeley, California. Oberrabbiner und Prediger der isrealitisen Cultusgemeinde in Wien, gestorben am 28 December 1893. Leipzig : Liebes & Teichtner, 1894 L.B.I. N.Y.P.L. Leipzig : Verlag der Leipzig-Loge, 1905 , 64 p. L.B.I. Breslau, 1917, 367-384 p. L.B.I. Joseph Bechor Schor, ein nordfranzoesischer Bibelerklaerer des XII Jahrhunderts. Leipzig : Fock, 1908 , 61 p. L.B.I. N.Y.P.L. Schrifften herausgegeben von der Gesellschaft zur Foerderung der Wissenschaft des Judentums.
" ... voertraege, gehalten am 23 Dezember 1907 zu Berlin". 1. Joseph ben Isaac Bekor Schor, of Orleans, fl. 12th century. Wien : Gerold , 1875, 76 p. L.B.I. Author's autograph presentation copy to Prof. Lazarus. Die Anfangsgründe der hebraïschen und griechischen Grammatik des Franciscus Tissardus. On the application of artificial cold in the manufacture of paraffin in Austria-Hungary. In : International Congress of Refrigeration,II. Vienna, 1910; Reports and proceedings, English Edition, 1911, p. 685-690. Porges, S.W., & Coles, M.G.H. (eds. ), (1976). Psychophysiology. Stroudsburg, PA: Dowden, Hutchinson & Ross. Coles, M.G.H., Donchin, E., & Porges, S.W. (eds. ), (1986). Psychophysiology: Systems, Processes & Applications. New York: Guilford. Santiago da Chile ; 1967 ; 95 p. L.B.I. Achill : Tragoedie in 3 Akten; Berlin; S. Fischer, 1910, 123 p.
Daemmerung : Schauspiel in 5 akten; Berlin; S. Fischer, 1894, 139 p.
Johannes Herkner : Schauspiel in 5 akten; Berlin; S. Fischer, 1904, 155 p.
Koenigskinder : ein Deutsches Maerchen in 3 akten; S. Fischer, 1908, 127 p.
Nausikaa : Tragoedie; S. Fischer, 1906, 150 p.
Themistokles : Tragoedie in 5 Akten; Berlin; S. Fischer, 1897, 142 p.
Dortmund, editon ebersbach, 1999, 190 p.
Essay on Heinrich Porges, Angelo Neumann and Hermann Levi, three Jews who made it their task to promote Richard Wagner. Francke Verlg, Bern und Stuttgart L.B.I. provides a brief history of the Porges von Portheim family. 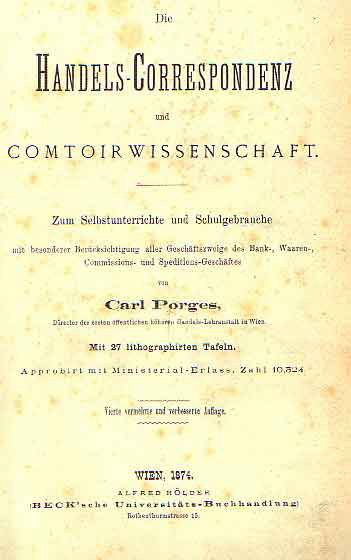 - "Erinnerungen von Moses Porges an den Frankisten Hof in Offenbach"
KTAV PUBLISHING HOUSE, INC., 1902 A.I.U. - Grätz, in Monatsschrift, 1877, pp 190 et seq. 2) created June 5, 1841 for Moses Porges [Wurzbach, xxiii, 125], divided azure and or. Upper division, azure, two stars or; lower division, two arms and joined hands, out of clouds, all proper. - Engel, Gesch. der deutschen Lit. Buchdruckerei "Aria", Cernàuti,str. Regele Ferdinand 18., 1925 A.I.U. Editorial enciclopedia udaica Castellana, México, 1950 A.I.U. Heinrich Porges (1837-1900) born in Prague, who died (Munich) in the midst of a rehearsal of Liszt's oratorio Christus. Ignàc Josef Porges (1812-1890) : provided the portrait of Rabbi Salomon Judah Rapoport in 1843.
provides details on the death of Madame Porgès, née Weisweiller, at the age of 42, in the fire that broke out in Paris at the Bazar de la Charité (a mundane charitable society) and the synagogue ceremony by Great Rabbi Zadoc Kahn. Guggenheimer, Heinrich W. & Eva H.
Ktav Publishing House, Inc. 1992 A.I.U. About Moses and Juda Porges establishment of the first cotton-printing factory in Prague.